To make the salsa: finely chop the chilli and mix with the tomatoes, the chopped onion and garlic in a bowl. Finely chop the coriander and mint leaves and add to the bowl then add the lime juice and season with salt and freshly ground black pepper. Allow to sit covered in the fridge for at least 20 minutes. In the meantime, season the lamb with a little salt and barbecue until cooked to your liking. Once cooked, allow the steaks to rest for 5 minutes. Slice open the pitta breads and add some finely sliced cabbage and sliced onions to each one. 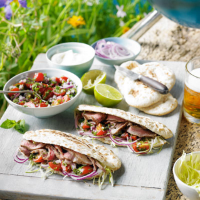 Spoon in some salsa then thinly slice the lamb steaks and add the slices to the pitta. Put a spoonful of yogurt on top of the lamb before serving.